The first Monday in September we celebrate Labor Day, a national tribute to the labor movement and a time to reflect on how workers contribute to our country. 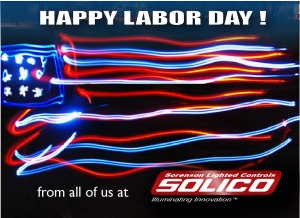 We hope you all enjoy the day off, Sorenson Lighted Controls will be closed Monday September 4th. We will re-open on Tuesday, September 5th. By submitting a comment here you grant Solico a perpetual license to reproduce your words and name/web site in attribution. Inappropriate comments will be removed at admin's discretion.